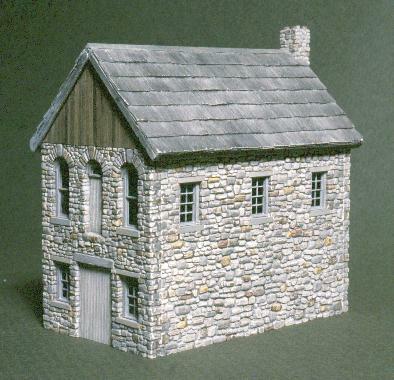 The Stone Shingle Mill is one of my most popular kits. It's one of my favorites, too. And why not? With its hand-scribed cobblestone walls, handsome face with arched windows and chimney to the rear. You'll love the cast cedar shake roof. It captures every bit of the fine detail of the hand-split, hand-laid shingle-by-shingle originals! Coloring and assemble is ease with my complete step-by-step painting and weathering instructions to guide you. I'm sure you will be very pleased with the results. This simple kit is a great introduction into the fun world of Hydrocal modeling. It's pretty easy and straight forward, with four walls and a cast roof. How hard can that be? We'll have you cut out the remaining plaster in the windows, trim the roof a little to fit the chimney. You can practice a little hand-scribing on the back of the chimney. We'll take you through the coloring process step-by-step. Paint and place the windows. Put just a little Elmer's Carpenter's Wood Glue on it and we'll have a fine model we're both proud of! The model was the subject of my construction article featured in the Narrow Gauge and Shortline Gazette in 1992. A photo of my pilot model. It's been to lots of shows. 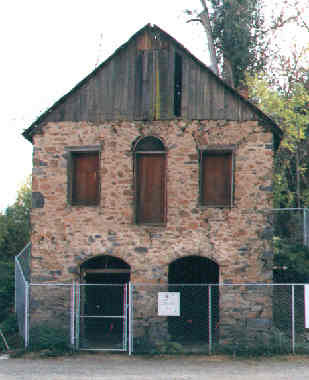 A photo of the real structure in poor repair. and so it's not an exact replica. But I think it captures the feel. The roof stock, my Cedar Shake Roof - Large, CSR-L, is also available. Perhaps it is more suitible for larger scales but I used it here. is the next model in this catagory. It has the same type stone walls though I cheated a little bit and never painted them. The cedar shake roof on the church is a finer, smaller shingle.